Cultural center professionals from across the state gather at the U of R for a conference. 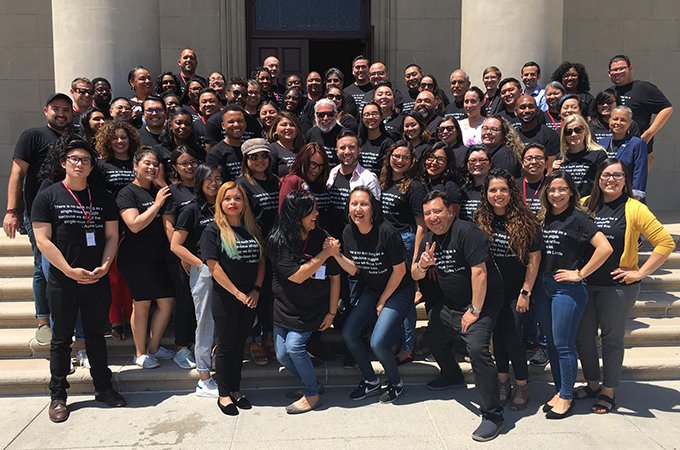 My colleagues and I in the University of Redlands Office of Campus Diversity and Inclusion (CDI) were delighted to host the California Council of Cultural Centers in Higher Education (CaCCCHE) annual summer conference recently. CaCCCHE, whose membership has included U of R for nearly two decades, confirms the essential and critical role that cultural centers play in addressing the unique challenges and opportunities presented by diversity. U of R Associate Director of CDI Reggie Robles (left) poses with Thavery Lay-Bounpraseuth of Cal Poly Pomona’s Asian and Pacific Islander Student Center. It was the first conference for U of R First-Generation Student Programs Coordinator Demeturie Toso-Lafaele Gogue. He remarks, “It was both exciting and moving to be surrounded by individuals from other institutions who understood not only the struggles of doing diversity work within higher education, but also the joy and sense of fulfillment this work that we are so passionate about." Another U of R administrator, Director of Native Student Programs Heather Torres, volunteered at the event. 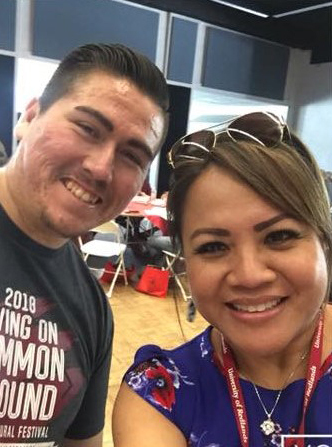 “I appreciated the opportunity to support CDI in hosting the conference and involving community members like Kim Marcus (Serrano, Cahuilla) in the blessing and the opening conference activities,” she says. “CaCCCHE is an important space to connect with others and challenge each other to do better for students.” Torres notes that she represented one of two Native American student programs at the conference, facilitating important dialog and building professional relationships. Having worked with CaCCCHE since my arrival at Redlands as special advisor to the president and associate dean of CDI in 2002, I echo many of the sentiments expressed by my colleagues. For me, CaCCCHE is family. In this group, there is no need to explain the nature of our jobs. Here is understanding and support from all members. Leela MadhavaRau, U of R special advisor to the president and associate dean of CDI, receives an award from Redlands alumnus Koby Rodriguez ’08, assistant director of the UC Davis Cross-Cultural Center. 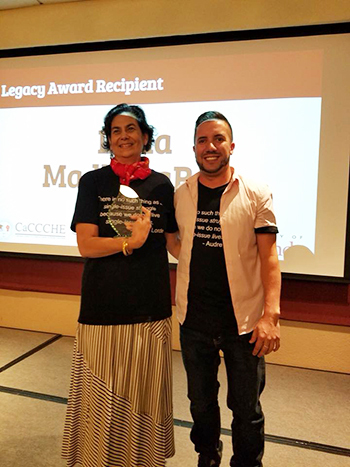 During the conference, I was honored to receive one of the inaugural CaCCCHE Legacy Awards for my work at Redlands and mentorship to CaCCCHE members over the years. Making it especially meaningful was the fact that Redlands alumnus Koby Rodriguez ’08, currently assistant director of the Cross-Cultural Center at the University of California, Davis, presented the award. Please visit the U of R Campus Diversity and Inclusion web pages for more information on our programs.